Shortly after returning from the Austrian Alps I was loading back into another airplane to head to Utah for some guide training work and some ski industry content work. I was also looking to keep getting in shape for my looming Japan trip just around the corner of the calendar. ^I grabbed a late night flight and kissed my wife, kids, and pup goodbye. Even later into Utah and I snagged an Uber ride into my ski bum shanty nestled in the back corner of my workshop just behind one of my rental properties in Ogden, Utah. I have been working on my shanty there for quite some time, and this trip was a test in how well I would be able to heat the space. The first night was a cold one for sure! I could not get it above 45 degrees Fahrenheit! Needless to say the next day I was determined to get a larger heater. ^The next morning I rose to gather my gear, fired up my old Subaru, and got out on my way. 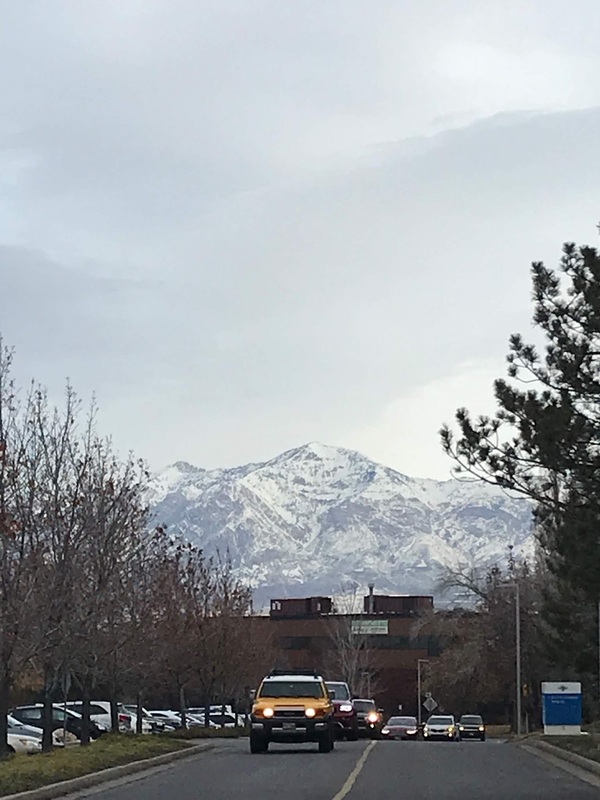 As I drove away from my morning breakfast stop the largest mountain in the Ogden range loomed over my commute, Ben Lomond. 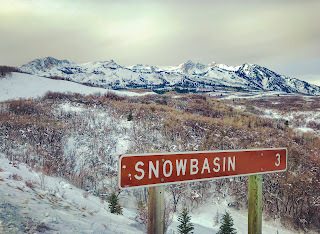 ^A short drive later I arrived at my backyard ski resort, Snowbasin. 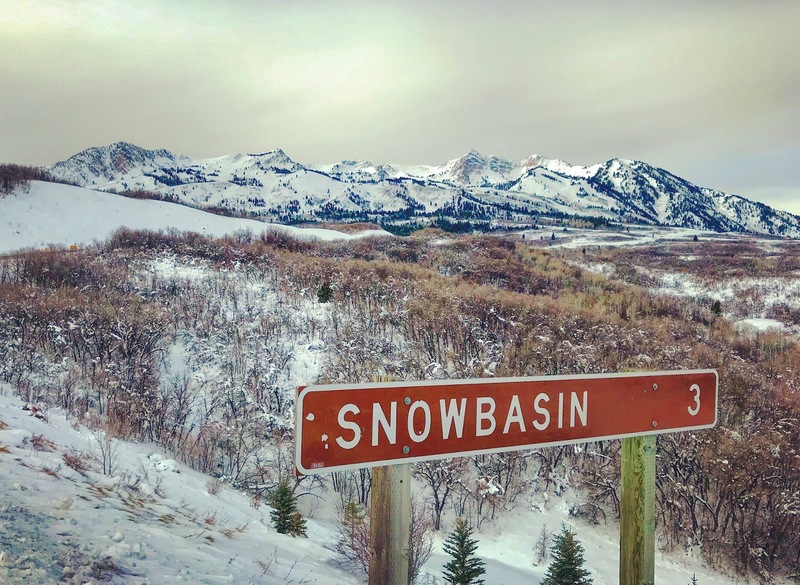 The drive was difficult as it was the first time I was returning to this place to ski since my dear friend and go-to ski partner, Ben Geiger, had died this summer. I cried all the way up as every song that came through my speakers reminded me of him. Every turn in the road had memories attached to it. 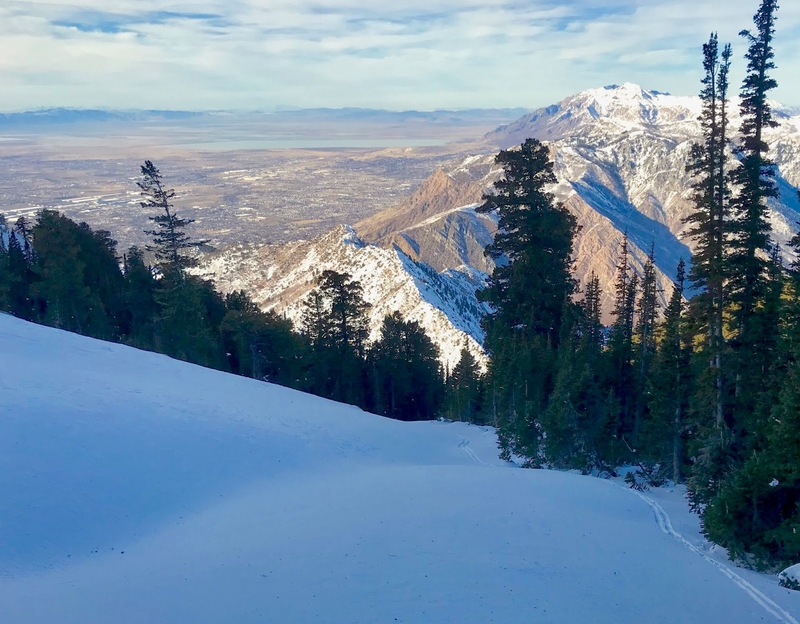 Every view dripping with nostalgia and blanketed in a thin early season snowpack. 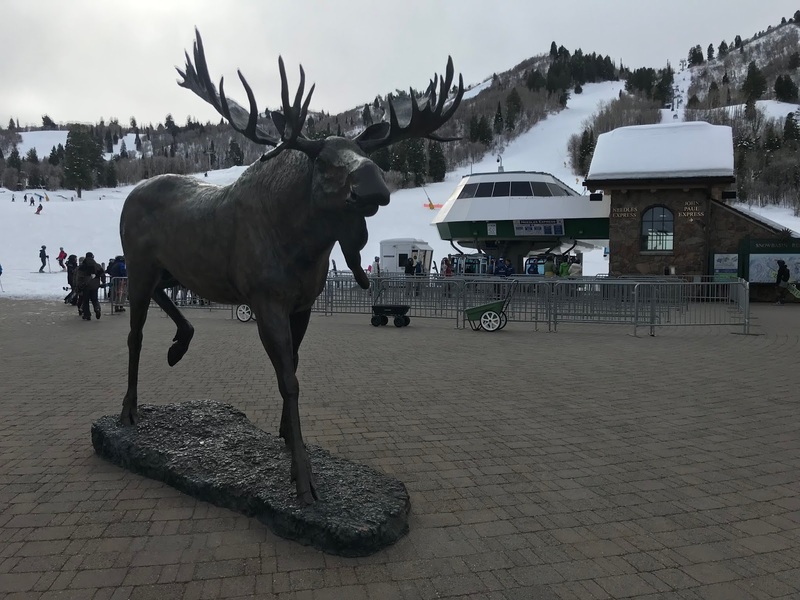 ^The base area moose statue greeted my arrival and I anxiously awaited the first encounter with our friends. I was unsure if I'd be able to hold a smile, or break down in a puddle of tears. 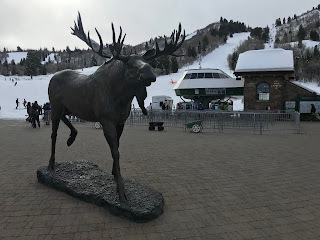 Thankfully, the first person I saw on my way from the famously golden and marbled bathrooms in the lodge was one of the happiest and cheerful friends that I have there. AJ (Gotschall) Baacke was among some of my first friends in Ogden when I first arrived in Ogden at Weber State University all those years ago by now. She is one of the most cheerful people I know and donning her classic giant smile she gave me a big hug. AJ and her husband Brian are a joyful couple and as I reminisced with them in the lodge and admired their beautiful baby boy donning a Powder bib my wife and I gave them I was happy to be able to start my day on a more cheerful note. They had AJ's whole family there as they were celebrating her parent's 50-year wedding anniversary. A beautiful milestone with some of the most genuine of people. I grabbed a gondola ride with Brian and our friend Sean Moyer and had a bunch of laughs on the ride up. Brian and Sean are Chicago boys and we talked about our mutual hometown area, the Chicago Bears beating up on my Green Bay Packers football team, and everything in between. We offloaded and parted our separate ways because I had a mission to scout the Ogden ridge line backcountry, and visit a monument that was erected in memoriam of Ben and in honor of the backcountry terrain that falls away from the Ogden ridge line that we loved so dearly. ^It felt really good to be back on the skin track to the ridge. Demoisey Peak towered over the horizon. So many lines Ben and I had skied there together. We cut our big mountain teeth together on this ridge. 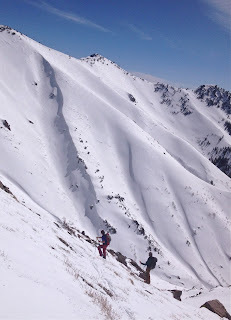 We failed, succeeded, and most of all learned so much all the way across this ridge line. I was awash in the memories all the way up. ^Finally, I reached the statue. I had lunch there and a conversation with my old friend that I did not equate as much with the statue, but with the wind that was whipping a fresh storm into the area. Of course, as soon as I was eating my lunch the storm arrived. Being my first foray onto the ridge, and being solo, I opted to take my buddies cue and turn tail to return to the ski area. I didn't know the snowpack or the depth, and I did not want to push my luck. I made a few more runs in the resort to feel things out and called it a day. ^The next day I had a few more scout missions that I wanted to attend to. I rallied a local buddy, Greg Roman, and was fortunate to have an old college friend in town from Tennessee as well, Matt Roberts. Matt was also amongst those first ski buddies of mine along with Ben when I arrived in Ogden. He had a big huge hug for me as he knew the significance of my time there for me as well. Felt good. 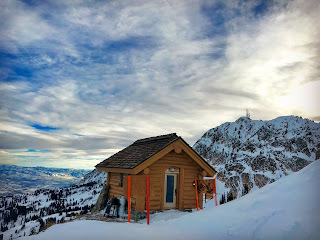 Greg, Matt, and I ventured out to see some of the classics out the northwest boundary into the Snowbasin periphery to see the various factors of the differing aspects and elevations. ^The lower elevations were plenty scrubby still! 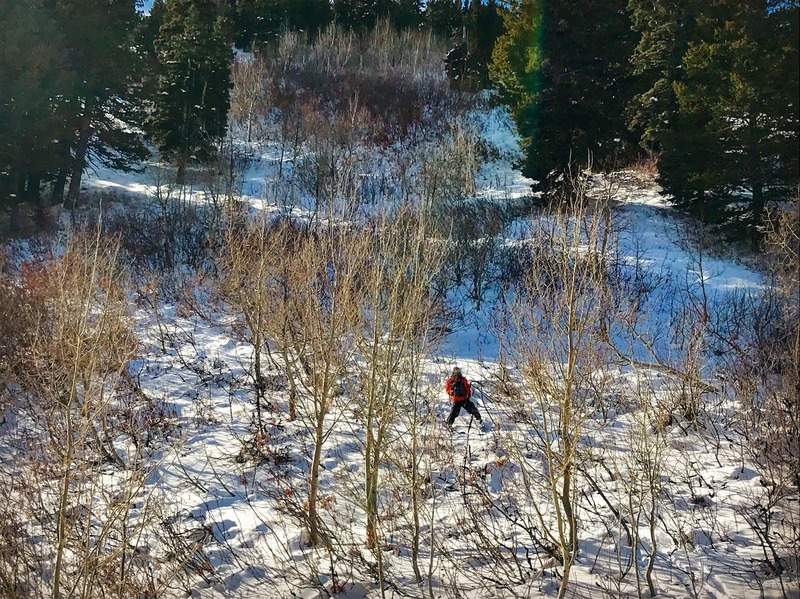 In this picture above Greg navigates some classic Ogden scrub oak just above what will eventually be a favorite backcountry slope of mine again. Not this trip though. We fought our way through it, and chalked it up to more information and a "not yet" ruling for the zone. 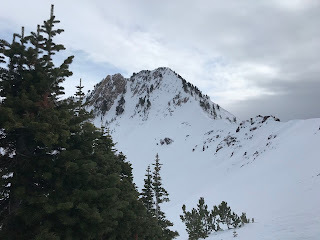 ^Greg had to leave, and Matt had to attend to his sons skiing in a lesson in resort so I retreated to a zone I knew would be about my only chance for good backcountry snow. The wind had hit the Ogden mountains really hard. Almost anything up high was jacked, and the lower elevations were still too thin. However, this zone is both wind sheltered and higher elevation and north facing. So I gave it a try. To my delight it was probably as good of snow as anyone was going to find in the Ogden mountains, and I was feeling the love pretty hard. Solo touring in one of Ben and I's go-to zones had the feels firing off. ^The views were just as rewarding as the tour. ^As I crested back to the Snowbasin ski area gate I stumbled upon a local friend, Mike, and a buddy of his, Marko, and we headed back out for another lap in the zone. The last time I saw Mike before this was at Ben's funeral and it was pleasant to leave that behind us to get back to doing what we all love doing together. ^I did that last lap with Mike and Marko and called it a day. 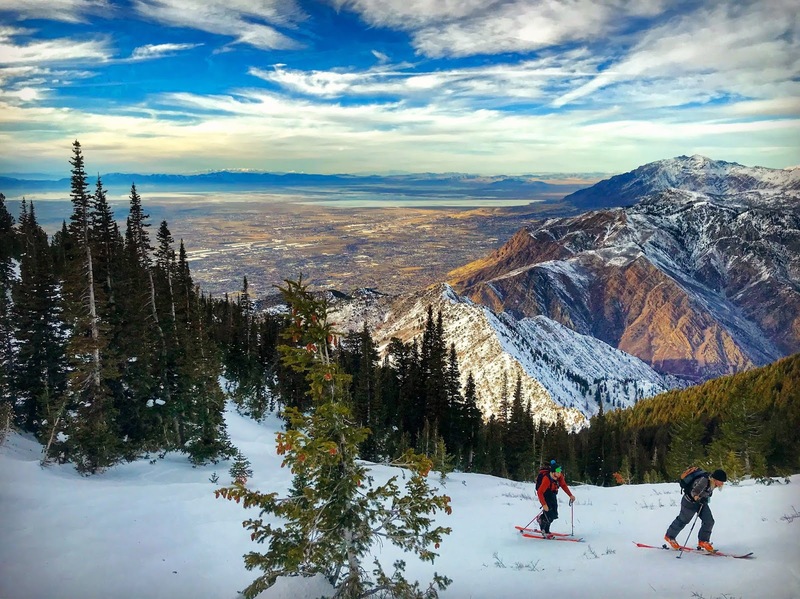 I had an early rise the next morning on the calendar and wanted to leave a little gas in the tank to be able to hang solid on the dawn patrol tour with the some of my SLC friends down south. ^I linked up the Tyler Jones who was visiting from Norway dark and early at a local coffee shop. Tyler and I have been friends online for a while and had been talking about a Norway project for quite some time. Tyler is an American ex-pat living in Norway and has some radical terrain and projects there in his pocket that I hope to be able to take on with him at some point. One of my new sponsors, Moonlight Mountain Gear, is headquartered in the north of Norway and Tyler's projects are right near there. It would be an efficient project to take on, and I look forward to being able to pull it off at some point in the future. This particular morning Tyler and I met up with SLC local boys, Travis Bellantino and Taylor Johnson. We put together a Little Cottonwood classic dawn patrol tour and garnered some glorious sunrise views and a few decent turns. 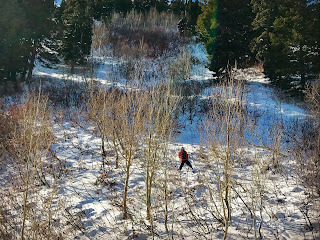 The wind had done it's work down there as well and it was a chore to find some cold sheltered powder, but we all know the game and found some good ones. I even managed to get some good pictures as well. 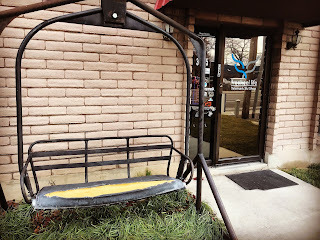 ^Of course, anytime I am in SLC I have to swing by the Freeheel Life shop and see the fellas. Josh Madsen is the owner of Freeheel Life and he and I go way back. We have traveled the globe and partnered on so many ski projects I have long ago lost count. This shop will always be a special place to me. 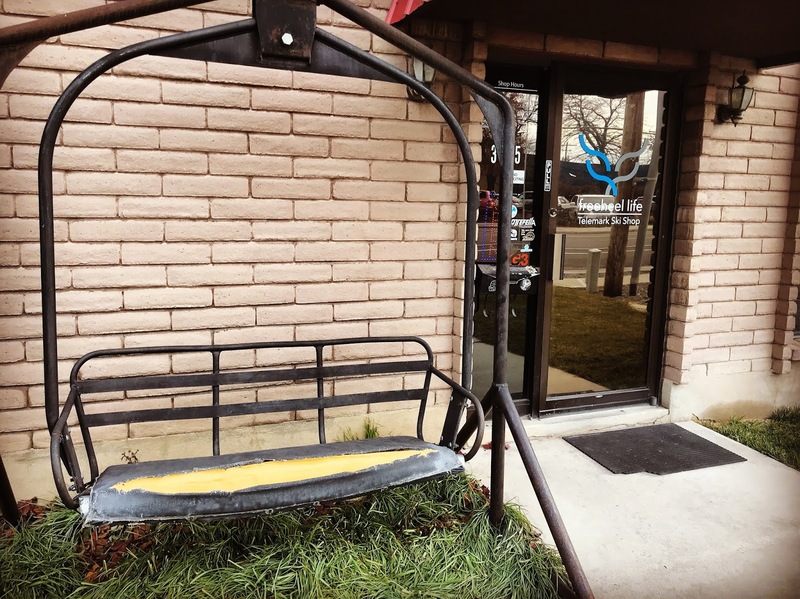 I remember the empty space he moved into and I did a lot of work for him to help build this place into the headquarters of the telemark community it has become. 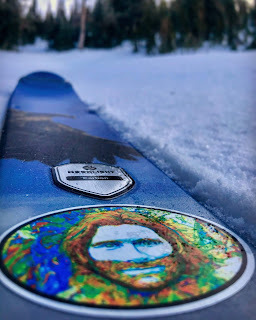 It is friends like Josh and the crew there that are the true gifts of this life on skis in this telemark community. 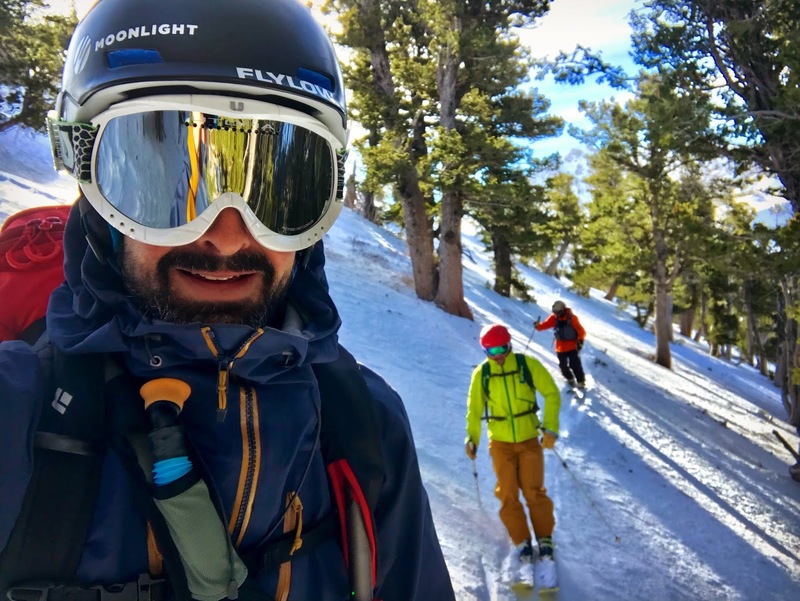 I have skied all over the world, but more and more as I age it is the people I have traveled with and met along the way that I value more than ever. 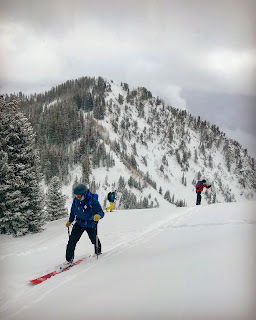 ^The next day was a training day with one of the guide shops I work for in Utah. 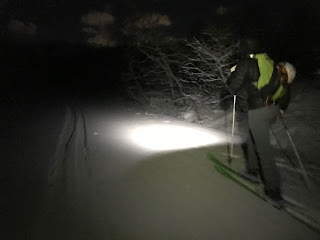 Bear House Mountain Guiding was the first service to give me a job and I was excited to get out with the owner, Derek DeBruin, and some of the crew to scout some new terrain under permit. The weather was in and out, but we were able to see a bunch of the area and get our bearings dialed. 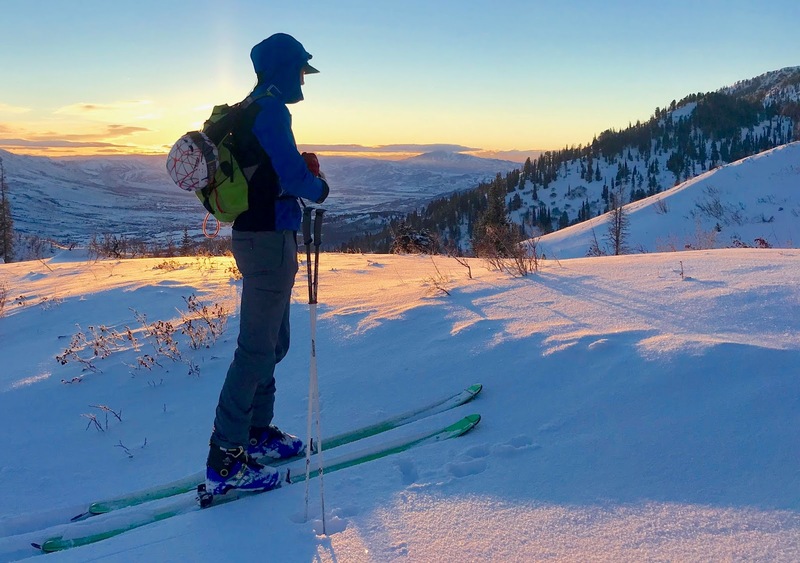 The next day I had another training day with my newest guide shop partnership with Inspired Summit Adventures out of Park City as well. My good friends Shaun and Weston Deustchlander run the business and I am so stoked to be joining their team. I am fortunate to have a lot of good friends and mentors in this industry. They have all given me some many gifts of knowledge and fellowship. I would not be even remotely as close to living these dreams out that I have been able to without every single one of them along the way. I could not even begin to name them all here. I took an opportunity to go up to Ben's house to visit his wife and kids and have some dinner with them. Every time I am in town I have made him a promise that I will do so. I am sure it is not necessarily easy for them to see me, but I am so grateful that they let me come over and do so. It feels so good to see them and have some smiles, laughs, and share stories with them. It breaks my heart to think about his kids, Monroe and Laird growing up without him there, but I will do my best to try to bring even a little bit of our shared way of life to them. Ben and I were a lot alike in many ways and just maybe I can bring a little bit of a taste of those shared traits to their lives. I wanna take them skiing and explain the mountains to them in the way that he and I both saw the mountains and experienced them. I wanna take them to jam band and bluegrass concerts some day and explain the intricacies of a really good solo jam, the beauty of a crescendo and how that feels. Peak hikes, appreciating nature, mountain biking, and all these things their dad and I spent twenty years enjoying together. I know it won't be even remotely the same for them, but if it is even just a little taste of it, then I would be honored if they'd join me and let me try. ^The next day I lucked out to have a friend passing through town for just one morning, Brian Ellison. 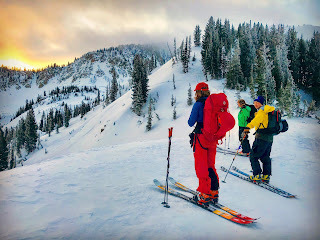 I met Brian on a skin track on the Ogden ridge line just a couple years earlier and he quickly became a go-to ski touring partner for Ben and I. He was a Chicago kid and he grew on me really quick. Same with Ben. Brian went to work with Ben in stone masonry, and Ben taught him the trade that he has taken to like a duck to water. 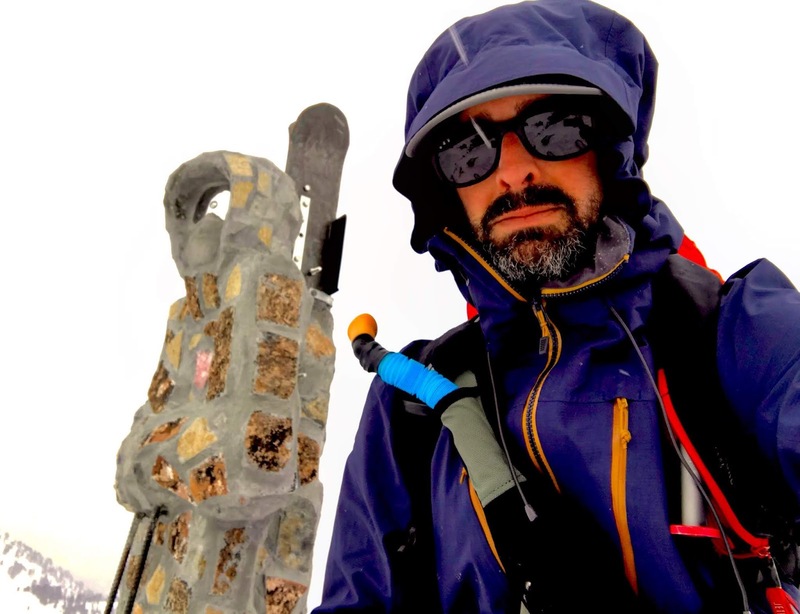 Brian and Ben quickly became really good friends, and when I moved back to Wisconsin last summer it seemed Brian filled my shoes with Ben to a certain degree in a partner for a variety of mountain missions. Brian was with Ben when he died. He lived the horror of trying to revive Ben with CPR in the fog of that chaos. I have been in those shoes in the past and it breaks my heart to think of Brian in that scenario. His efforts were futile as Ben's heart had given out before he even hit the ground, but that panic and that fear that Brian lived through that day will always be something he will never really be able to forget. I know that feeling. I have been there with friends of mine in the past. Those memories never fade. As I told him this summer when we went out for a spirit hike that week of Ben's funeral services, we can never live those moments down. We will always feel them as poignant as ever, but in time we begin to find a strange peace with those feelings. It is an odd acceptance with our "what ifs" and "could haves" and "should haves". It took me years, but it callouses over in time like an old scar and even serves to make us better people. More gracious souls. More ardent in our appreciation for the fragility of this whole human existence. We love a little harder, and we tell those we do a little more often. Anytime someone has an experience like that we realize how easily we really do die. How fleeting the moments of life really are. I say these days that dying is really easy. It is living that is hard. We all like to pretend that we have so much control in our lives, but we just simply don't. Anyone who lives through an experience like Brian did learns this. It happens so fast, and so easily. The horrible experience can be a positive influence though. As callous as that may sound, it really can. I have lived it, and I can tell you that it really can. It takes time, and a lot of tears, but it can. ^Neither of us took this sunrise tour for granted that is for certain. We talked life, love, ski bumming and everything in between. We breathed in this beautiful sunrise like it was both our first and last. We only had a morning, and Brian had to descend and carry on down the road. 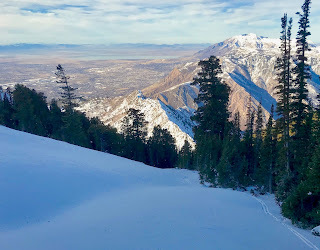 I stayed up high solo for the rest of the day and skied some more glorious powder on a bluebird day in the Ogden mountains. That night I linked up with my good friend, Paul Wright, for dinner with his family. 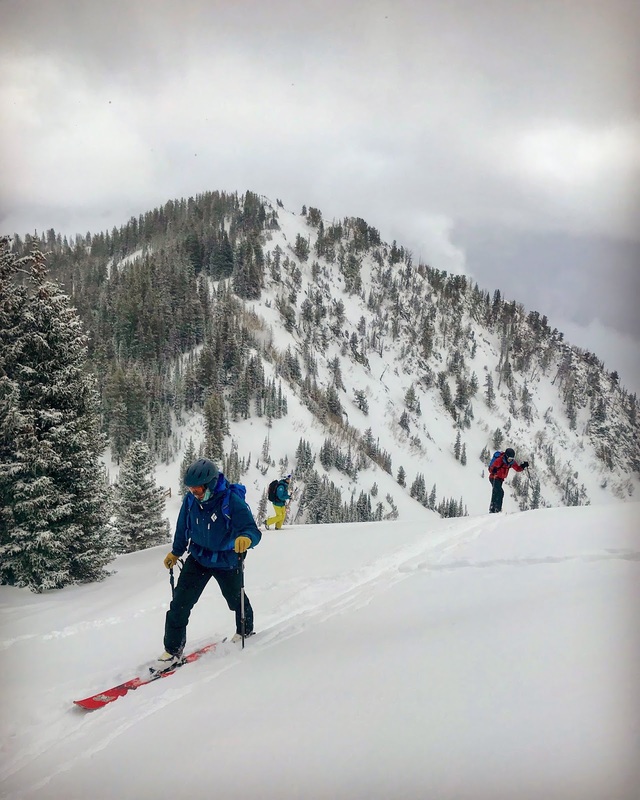 Paul was a valued mentor for Ben and I in the Ogden backcountry as we cut our teeth. These latest years, Paul worked with Ben in Ben's stone masonry business. After I moved this summer, they both came to Wisconsin and spent an incredible long weekend with me enjoying the countryside, my family, and some awesome concerts just two weeks before Ben died. It was the last time I saw Ben. That weekend will forever be gold to me. Paul and I have grown even closer throughout this whole ordeal. It seems we are both latching on to each other to try to fill the hole left by losing our mutual friend. We both feel a sense of responsibility to Ben's wife, kids, and family that weighs really heavy on our souls. Paul is running the stone business Ben built. I am running the rental property work Ben and I were partners in. We both want to do the job well. We both seem to feel a bit overwhelmed at doing so without our partner. Paul's task is monumental. Mine not as much, but I can tell the sense of responsibility weighs on us both. To do the jobs well means we can help out Ben's wife and kids financially as well as honor him in some degree. I know Ben would not want us to feel these pressures on account of him, but I also know that we both will no matter what at this point. I don't believe these are his legacy because his wife and kids are the only legacy of his that really matters, but I think both Paul and I cannot help but feel that way. It is a heavy weight. Paul carries it really heavily. I could tell during our dinner and our conversations. I wanted to reassure him that Ben would not expect any of this of us, but I could also tell neither of us was really buying it all together either. ^The trip was jammed packed and busy as hell. It flew by so fast that I was not able to achieve half the goals I wanted to for the trip, but I got done the major priorities. Before I knew it I was back on a plane heading back to my hometown in Wisconsin. My wife and kids picked me up from the airport, and to have both my boys come running as I walked through the arrival gate to grab onto me with big hugs was such a special treat. 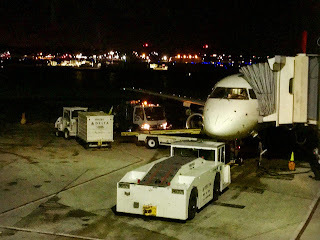 The holidays were right around the corner and I knew that the busy was just going to keep on going strong right into my Japan trip scheduled just after the New Year. I was determined to make the most of it in enjoying my family time with as much gratitude and appreciation as I could muster after my soulful return to the emotional Utah early winter trip. ^These two little boys are my heart. My wife is my rock. The three of them and our old dog, Murphy, are the center of my universe. My time away from them is indeed difficult, and I always return with such a depth of gratitude though that it serves to help me really cherish them and the time I have with them. To spend time with Ben's family helps me appreciate how I can so easily lose that gift. 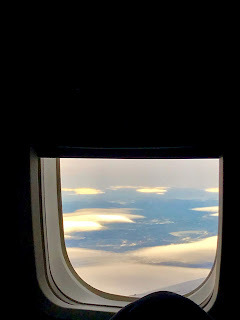 To have time away from them allows me the chance to miss them deeply, which in turn affords me the gift to appreciate my time with them on a level that maybe I would not attain if I never left to do the work I always dreamed to do be able to do. It is a double edged sword this life I have chosen. I am not sure I can do it any other way, but just like anything it has it's pros and cons. Just like anyone I have trade-offs. It works for me though. It seems to be able to work for them as well. I hope they understand. I hope they get it some day. I hope they feel how deeply I love them when I am there, and even when I am gone. I hope they know that every time I come home is among the greatest feelings in the world to have them run up and jump into my arms. 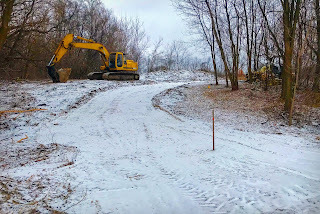 ^The home I am building for them in rural Wisconsin is also progressing in my absence. My good family friend, Brad Sanderson, is excavating our driveway while I am gone. I have spent the last two summers lumberjacking the property to get ready for this driveway and the house. It feels good to see the progress. 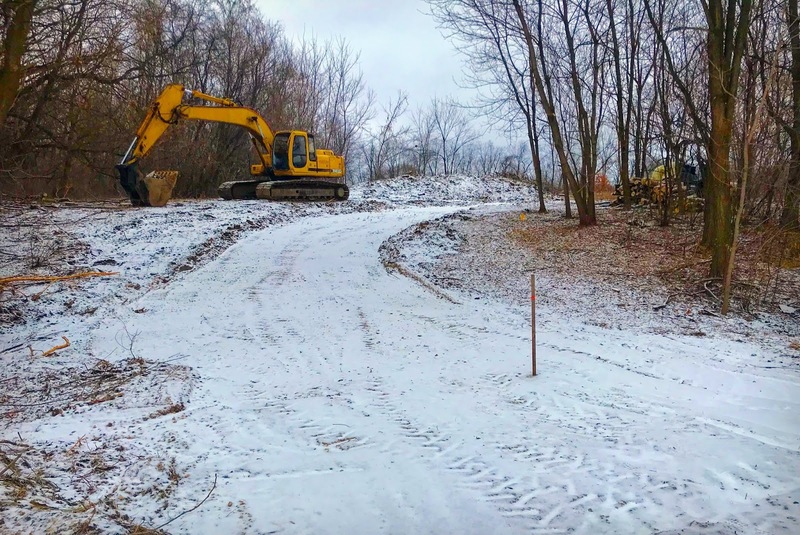 The Wisconsin winter has been unseasonably mild, but it has afforded me the opportunity to get this driveway in and settling so I am not complaining. ^Then Christmas was upon us. 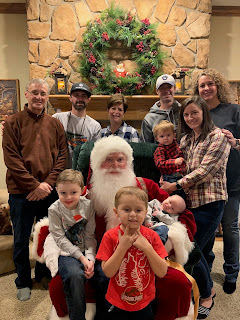 This picture with Santa Claus at our family friends, the Curran's, house shows my whole immediate family. My parents, my wife and kids, my brother and his wife and kids all in one picture. It is the true gift of the holidays to be able to spend this time with all of them. For many years I was not present for a lot of these kinds of things in my pursuits of my dream career out west and around the world. I am happy to have the opportunity again. 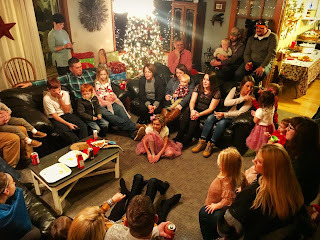 ^All of my mother's side jammed into my parent's living room. The sound of playing kids, laughing cousins, and chatting aunts and uncles is music to my ears. Not to mention the food. I had a goal to just get fat on all of it while I was home. ^My Dad's side is always full of so much laughter that I end up with sore abs afterward. 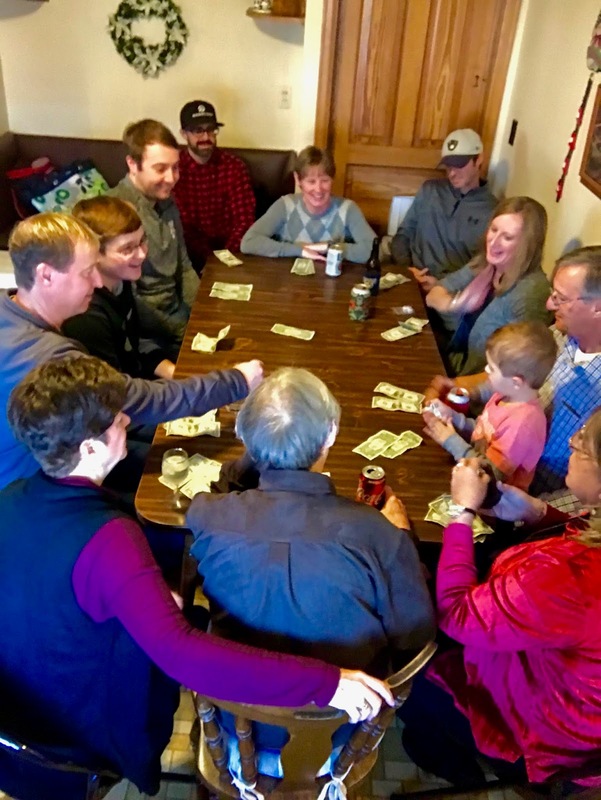 It is a strange dichotomy for my brother and I to be among the oldest cousins on my Mom's side and among the youngest on my Dad's side, but it makes for two very different family party experiences. Tons of little kids and babies on my Mom's side, and dice games and glory days stories abound on my Dad's side. I am a grateful man for all of it. 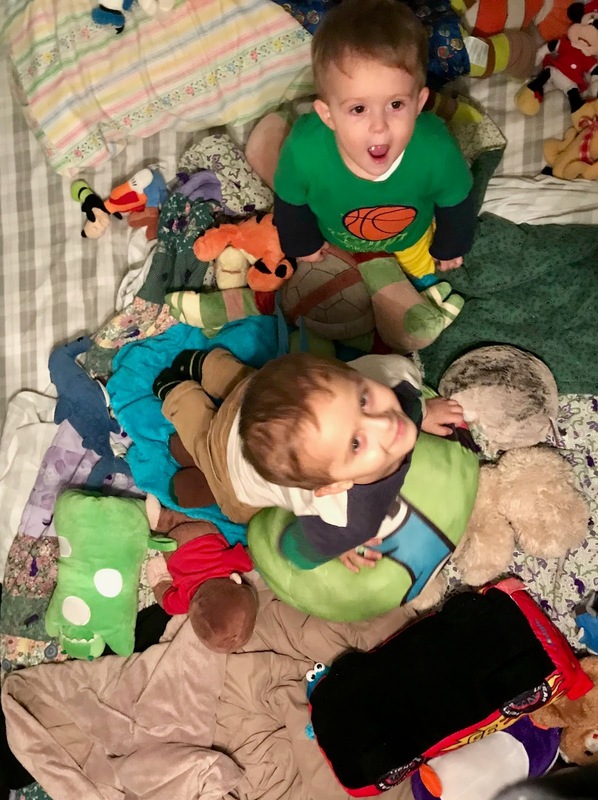 Moving back to Wisconsin has been a mixed bag for me personally, but as I have been explaining to people whenever I am asked is that for all the reasons we moved home in the family aspect... it has been great. My family understands that I still have to leave to pursue my work in the ski industry and backcountry ski guiding, and as long as they allow me to do that it seems I have my best life. I am afforded a great deal of time with my family in the off-season and I still get to do the work I am called to do in the winter. I can't imagine doing it any other way. I can't imagine this life would work for everyone either. To be honest I am still unsure if it will work for me forever either, but it works for now. I feel like the luckiest man alive to be able to do it all. For now, life is good, and as long as it is all good with all of those I hold dearest, then it is all good with me. I almost always come around to the end of these posts simply expressing gratitude at the blessings of my life, but in all honesty I can't really think of any other way to think of it. I often feel like I am barley holding on to all of it. Knowing more then ever the fleeting nature of everything, and my life itself, I know that I really am not in control of any of it. I can book the flights, and make the schedule, but it is the people in my life that make it all so precious and amazing each and every day of this crazy ride I am on. How can I be anything but gracious on a ride like this. I don't think any other emotion would be the right one. So it is what it is, and I am what I am. Onward I go.